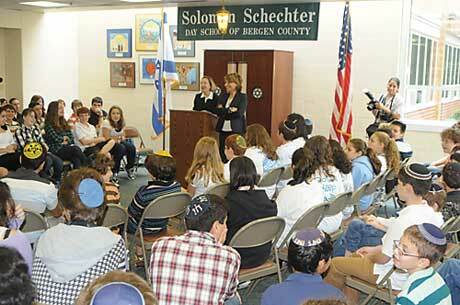 Dalia Itzik, Israel’s first female speaker of the Knesset, brought a message of peace to New Milford’s Solomon Schechter Day School on Tuesday as she addressed community leaders and students. Itzik first addressed a group of rabbis and school officials, updating them on events in Israel and the peace process and Iran. Last year’s Operation Defensive Shield was a response to a constant barrage of rockets from Hamas and eight years of restraint by Israel, she said. She labeled those who criticized Israel during the operation as hypocrites, and dismissed the notion that Hezbollah and Hamas are fighting for land. Extremists are also a threat to the Palestinians, so reaching “a clear and viable solution” is a common interest, she said. Itzik warned that Iran will be a danger to Israel and the entire West if it attains nuclear weapons. After a performance of “Havenu Shalom Aleichem” by the first-grade class, Itzik moved from one room to another to address the school’s sixth-, seventh-, and eighth-grades. She began by asking how many students understood Hebrew. The majority raised their hands. She then asked how many planned to visit Israel during Pesach. Again, the majority raised their hands. But when she asked how many wanted to be members of the Knesset, not a single hand went up, which drew a few chuckles. Itzik then took a few questions from students, which they asked in Hebrew and then in English. Every day Israelis greet each other with “shalom” or “mah shlomcha,” how are you, which comes from the same root as shalom, she said. “I don’t know any country in the world that dreams of peace [more than Israel],” she told the children. Speaking to the Standard afterward, Itzik said the number of Israelis and diaspora Jews who never knew a world without Israel is growing, and they need to understand their responsibilities to help the state, just as the founding generation built Israel. Even her own children, now grown, she said, don’t understand what a miracle the Jewish state is, and that Israel still needs to fight for its existence. That Israel is a democracy is another miracle, she said, considering that so many of the first wave of immigrants came from non-democratic countries in the Arab world. “It’s very important for the young generation that they understand, that they continue what we started,” she said. The 10-month settlement freeze, which Itzik did not support, was a major gesture to the Palestinians, which they should appreciate, she said. She does not support extending the freeze, but she and her Kadima Party support continued negotiations. Hamas, Hezbollah, Iran, and other extremist elements in the region do not threaten only Israel, and the Palestinians should recognize that, she continued. Peace is the ultimate goal, she said. Itzik, who began her career as a teacher, is a former deputy mayor of Jerusalem in charge of education. She was elected to the Knesset in 1992 as a member of the Labor Party, and has served as minister of the environment, minister of industry and trade, and minister of communications. In 2006, she left Labor for former Prime Minister Ariel Sharon’s fledgling Kadima. Later that year, she was appointed speaker of the Knesset, a position she served in until 2009. During that time, she twice served as acting president of Israel. Especially for the school’s female students, Itzik is an example of what women can accomplish, Gafni said.